the atmosphere of the “Città Bella” and of the whole Salento area. Linked to the land by a bridge (pedestrian/vehicle), the historic centre of Gallipoli offers an intricate maze of alleyways, set between the looming stone bastions dropping sheer into the sea. And it is within this scenery that visitors will find Al Pescatore, which allows guests to reach with just a short stroll the Cathedral of Sant’Agata, the Castello Angioino and all the main attractions of the city. A welcoming 4-star hotel, Al Pescatore Hotel & Restaurant is born of the restructuring of an ancient palazzo dating back to the 17th century. 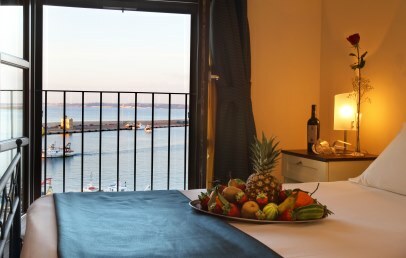 The Hotel looks over the port of the old city, offering guests splendid views across the Ionic shore. The 22 rooms of the hotel are marked by classic, minimalist style; some have a sea view. All rooms have en suite bath with shower, and have Wi-Fi connection, TV LCD, safe, minibar, phone and independent heating/air conditioning. The pleasant public beach known as La Purità is just 200 m from Al Pescatore, but the hotel’s position is an invitation to guests to discover all the Gallipoli beaches, indeed the area boasts the title of Pearl of the Ionian: to the south of the city the Bay of Gallipoli offers stretches of sand and tuff rock formations, as far as the spectacular beaches of Punta Pizzo. The rich à la carte menu of Al Pescatore Restaurant offers extra-fresh seafood dishes, varying according to the catch of the day. Guests can lunch or dine with a 10% discount on the menu. There is a rich breakfast buffet including cakes, brioches, fruit juice, jams, cereals, fresh and tinned fruit, yogurt, cheeses and cold cuts. The price of your stay includes free Wi-Fi connection in your room and common areas. Reception and the Bar are open 24/7. With a supplement you can request a laundry service (external) and one of the many excursions available in the territory. Small domestic pets are welcome, with a EURO 10 per day charge to cover extra cleaning. A public parking is available in the area for € 10,00 per day, subject to availability. 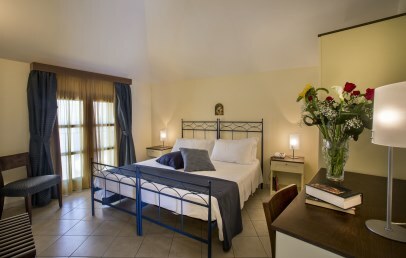 Large rooms with a sea view, these Doubles have en-suite with shower and also Wi-Fi connection, TV LCD, safe, minibar, phone and independent heating/air conditioning. 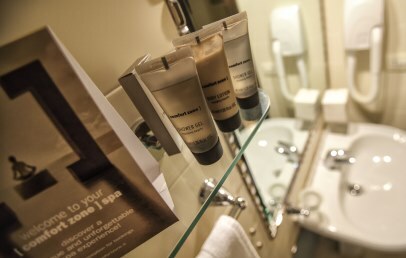 Welcoming rooms in classic style, these Standard have en-suite with shower and also Wi-Fi connection, TV LCD, safe, minibar, phone and independent heating/air conditioning. 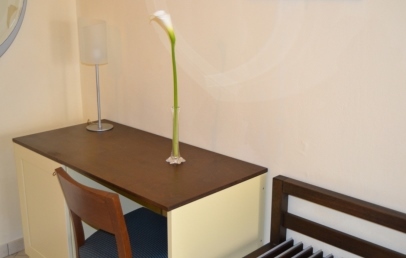 A small room with no window, Economy has en-suite with shower and also Wi-Fi connection, TV LCD, safe, minibar, phone and independent heating/air conditioning. 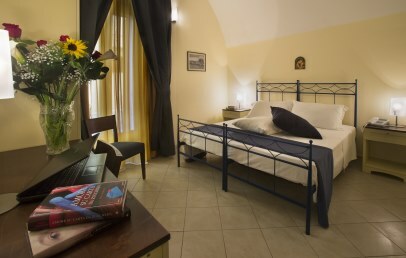 Welcoming rooms in classic style, these Single have en-suite with shower and also Wi-Fi connection, TV LCD, safe, minibar, phone and independent heating/air conditioning. Only for Charming customers: welcome drink at 7 pm in the Restaurant area!